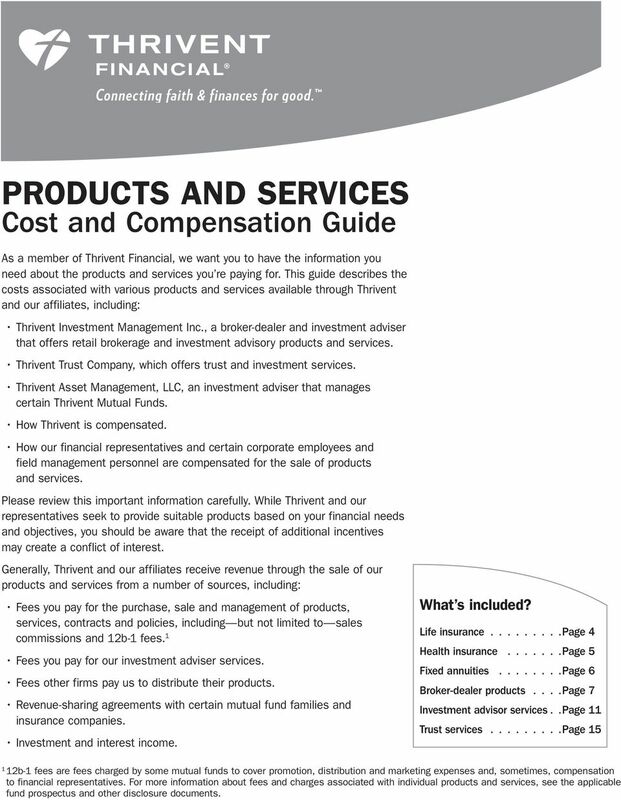 1 PRODUCTS AND SERVICES Cost and Guide As a member of Thrivent Financial, we want you to have the information you need about the products and services you re paying for. 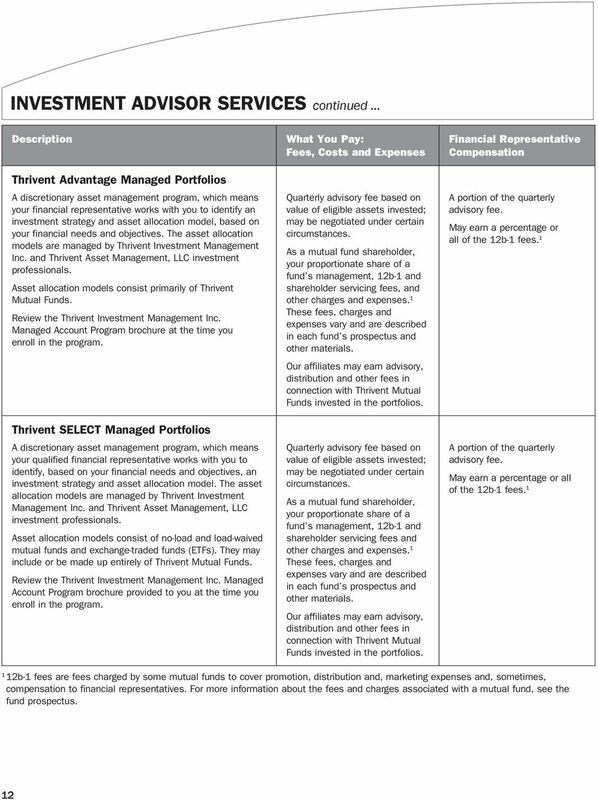 This guide describes the costs associated with various products and services available through Thrivent and our affiliates, including: Thrivent Investment Management Inc., a broker-dealer and investment adviser that offers retail brokerage and investment advisory products and services. 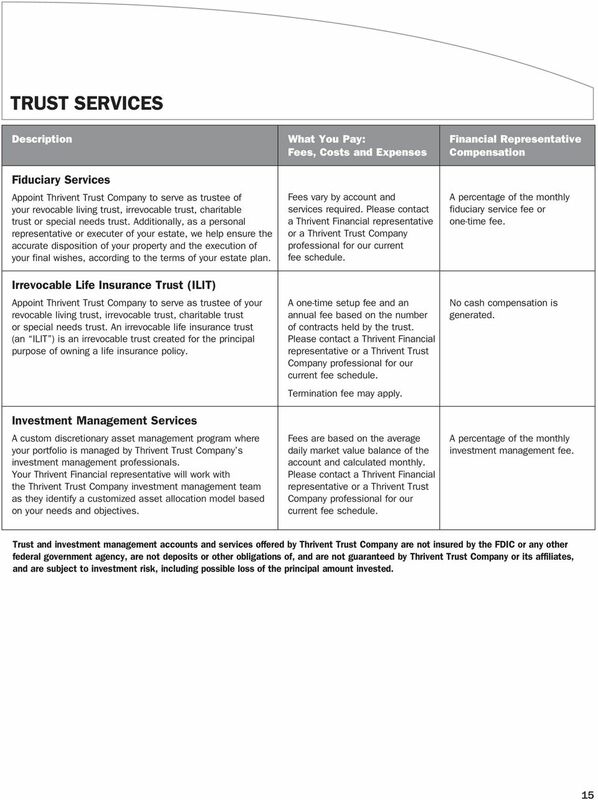 Thrivent Trust Company, which offers trust and investment services. 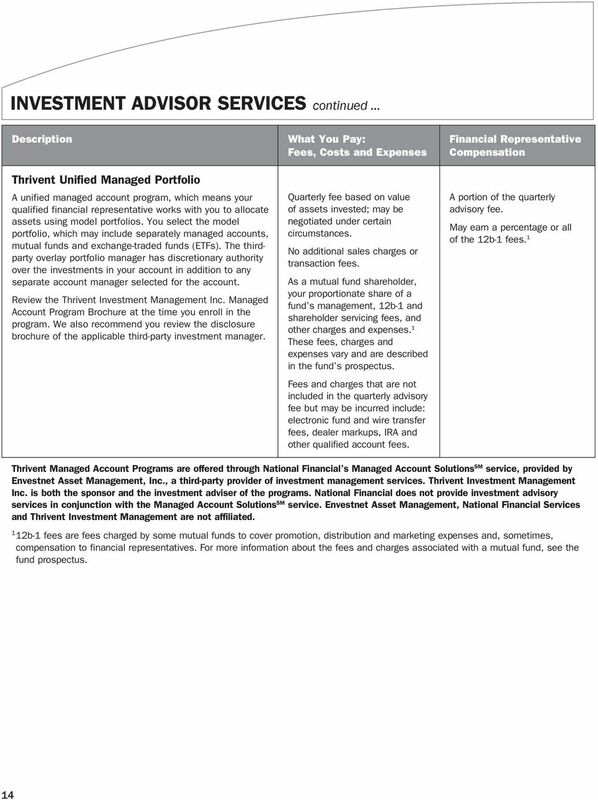 Thrivent Asset Management, LLC, an investment adviser that manages certain Thrivent Mutual Funds. How Thrivent is compensated. How our financial representatives and certain corporate employees and field management personnel are compensated for the sale of products and services. Please review this important information carefully. While Thrivent and our representatives seek to provide suitable products based on your financial needs and objectives, you should be aware that the receipt of additional incentives may create a conflict of interest. 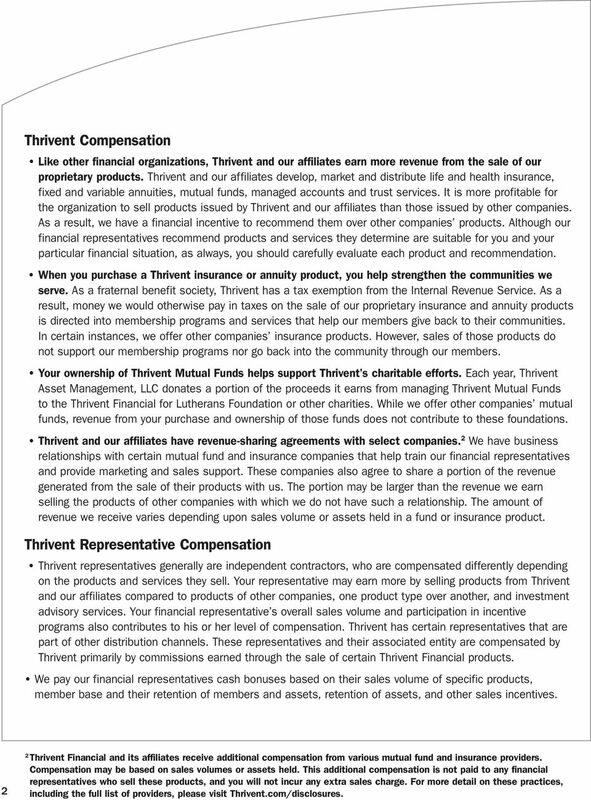 Generally, Thrivent and our affiliates receive revenue through the sale of our products and services from a number of sources, including: Fees you pay for the purchase, sale and management of products, services, contracts and policies, including but not limited to sales commissions and 12b-1 fees. 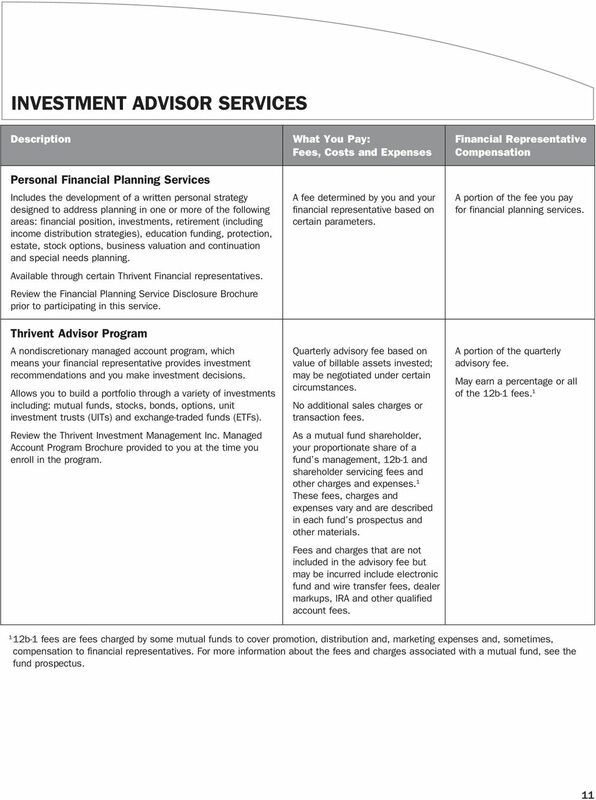 1 Fees you pay for our investment adviser services. Fees other firms pay us to distribute their products. Revenue-sharing agreements with certain mutual fund families and insurance companies. Investment and interest income. What s included? 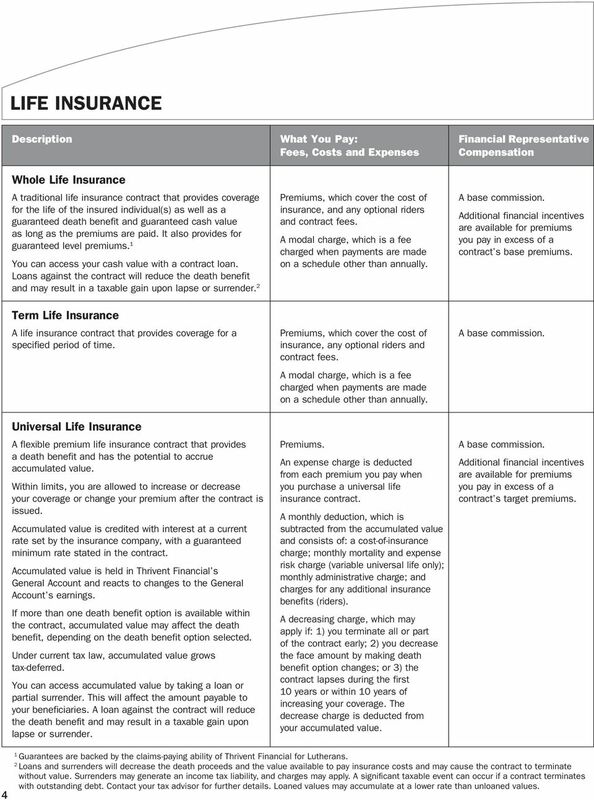 Life insurance Page 4 Health insurance Page 5 Fixed annuities Page 6 Broker-dealer products Page 7 Investment advisor services Page 11 Trust services Page b-1 fees are fees charged by some mutual funds to cover promotion, distribution and marketing expenses and, sometimes, compensation to financial representatives. For more information about fees and charges associated with individual products and services, see the applicable fund prospectus and other disclosure documents. 2 Thrivent Like other financial organizations, Thrivent and our affiliates earn more revenue from the sale of our proprietary products. Thrivent and our affiliates develop, market and distribute life and health insurance, fixed and variable annuities, mutual funds, managed accounts and trust services. It is more profitable for the organization to sell products issued by Thrivent and our affiliates than those issued by other companies. As a result, we have a financial incentive to recommend them over other companies products. Although our financial representatives recommend products and services they determine are suitable for you and your particular financial situation, as always, you should carefully evaluate each product and recommendation. When you purchase a Thrivent insurance or annuity product, you help strengthen the communities we serve. As a fraternal benefit society, Thrivent has a tax exemption from the Internal Revenue Service. As a result, money we would otherwise pay in taxes on the sale of our proprietary insurance and annuity products is directed into membership programs and services that help our members give back to their communities. In certain instances, we offer other companies insurance products. However, sales of those products do not support our membership programs nor go back into the community through our members. Your ownership of Thrivent Mutual Funds helps support Thrivent s charitable efforts. Each year, Thrivent Asset Management, LLC donates a portion of the proceeds it earns from managing Thrivent Mutual Funds to the Thrivent Financial for Lutherans Foundation or other charities. While we offer other companies mutual funds, revenue from your purchase and ownership of those funds does not contribute to these foundations. Thrivent and our affiliates have revenue-sharing agreements with select companies. 2 We have business relationships with certain mutual fund and insurance companies that help train our financial representatives and provide marketing and sales support. These companies also agree to share a portion of the revenue generated from the sale of their products with us. The portion may be larger than the revenue we earn selling the products of other companies with which we do not have such a relationship. The amount of revenue we receive varies depending upon sales volume or assets held in a fund or insurance product. Thrivent Representative Thrivent representatives generally are independent contractors, who are compensated differently depending on the products and services they sell. Your representative may earn more by selling products from Thrivent and our affiliates compared to products of other companies, one product type over another, and investment advisory services. Your financial representative s overall sales volume and participation in incentive programs also contributes to his or her level of compensation. Thrivent has certain representatives that are part of other distribution channels. These representatives and their associated entity are compensated by Thrivent primarily by commissions earned through the sale of certain Thrivent Financial products. We pay our financial representatives cash bonuses based on their sales volume of specific products, member base and their retention of members and assets, retention of assets, and other sales incentives. 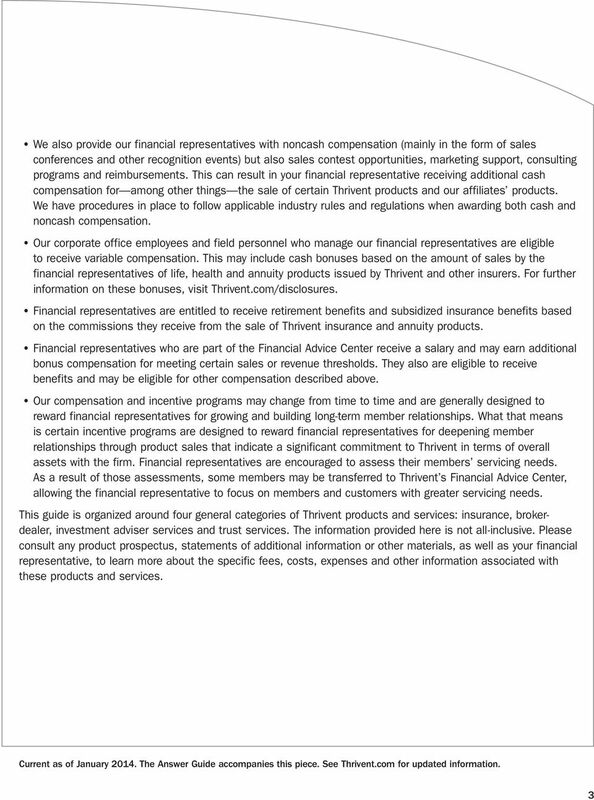 2 2 Thrivent Financial and its affiliates receive additional compensation from various mutual fund and insurance providers. may be based on sales volumes or assets held. This additional compensation is not paid to any financial representatives who sell these products, and you will not incur any extra sales charge. 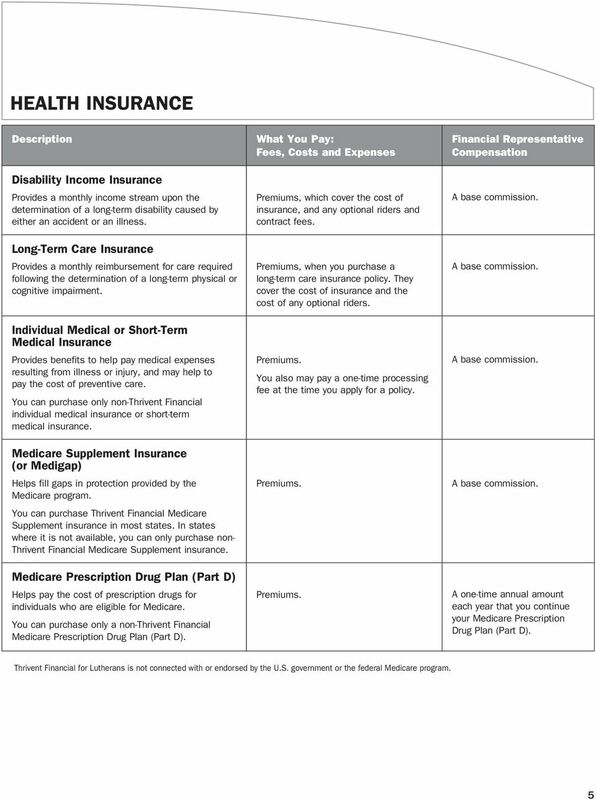 For more detail on these practices, including the full list of providers, please visit Thrivent.com/disclosures. 4 LIFE INSURANCE Whole Life Insurance A traditional life insurance contract that provides coverage for the life of the insured individual(s) as well as a guaranteed death benefit and guaranteed cash value as long as the premiums are paid. It also provides for guaranteed level premiums. 1 You can access your cash value with a contract loan. Loans against the contract will reduce the death benefit and may result in a taxable gain upon lapse or surrender. 2 Term Life Insurance A life insurance contract that provides coverage for a specified period of time. Universal Life Insurance A flexible premium life insurance contract that provides a death benefit and has the potential to accrue accumulated value. Within limits, you are allowed to increase or decrease your coverage or change your premium after the contract is issued. Accumulated value is credited with interest at a current rate set by the insurance company, with a guaranteed minimum rate stated in the contract. 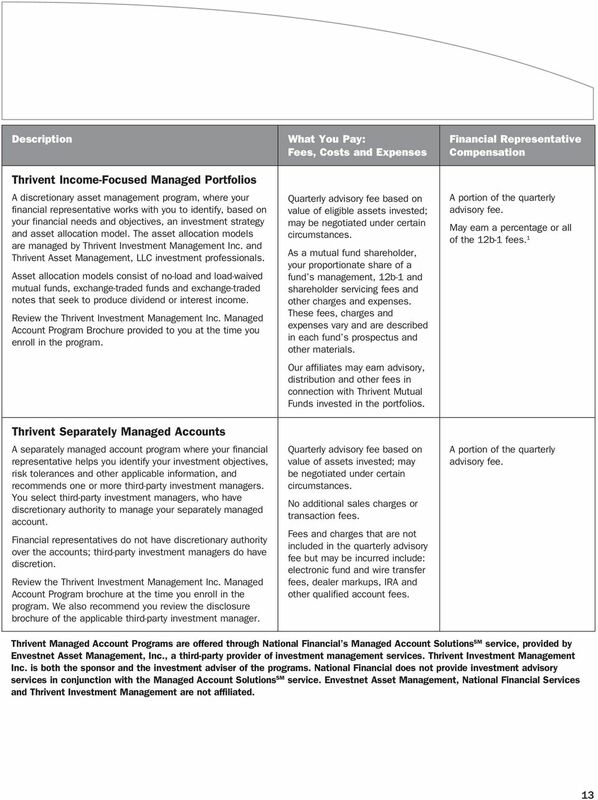 Accumulated value is held in Thrivent Financial s General Account and reacts to changes to the General Account s earnings. If more than one death benefit option is available within the contract, accumulated value may affect the death benefit, depending on the death benefit option selected. Under current tax law, accumulated value grows tax-deferred. You can access accumulated value by taking a loan or partial surrender. This will affect the amount payable to your beneficiaries. A loan against the contract will reduce the death benefit and may result in a taxable gain upon lapse or surrender. Premiums, which cover the cost of insurance, and any optional riders and contract fees. A modal charge, which is a fee charged when payments are made on a schedule other than annually. Premiums, which cover the cost of insurance, any optional riders and contract fees. A modal charge, which is a fee charged when payments are made on a schedule other than annually. Premiums. 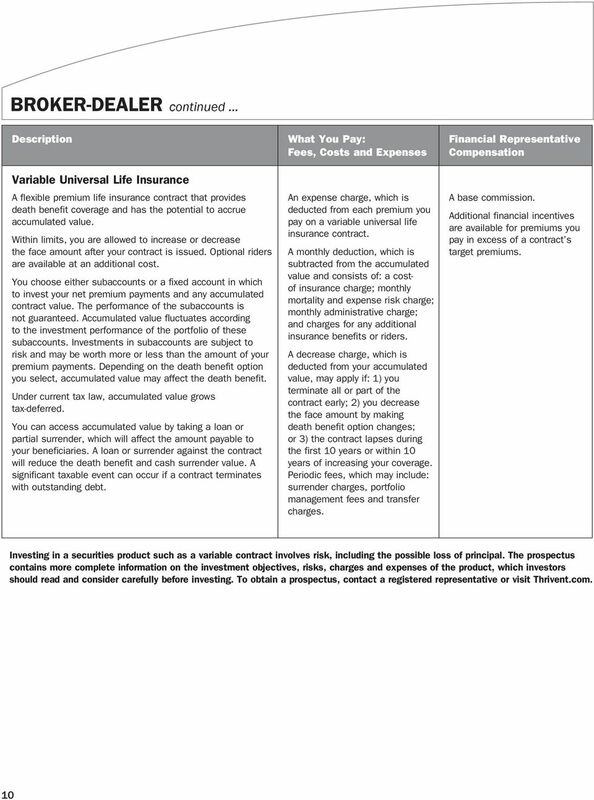 An expense charge is deducted from each premium you pay when you purchase a universal life insurance contract. 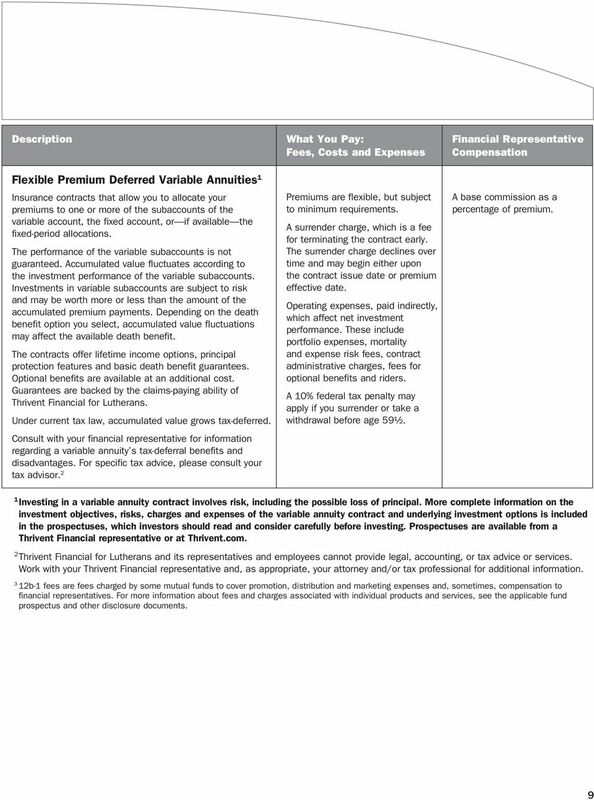 A monthly deduction, which is subtracted from the accumulated value and consists of: a cost-of-insurance charge; monthly mortality and expense risk charge (variable universal life only); monthly administrative charge; and charges for any additional insurance benefits (riders). A decreasing charge, which may apply if: 1) you terminate all or part of the contract early; 2) you decrease the face amount by making death benefit option changes; or 3) the contract lapses during the first 10 years or within 10 years of increasing your coverage. The decrease charge is deducted from your accumulated value. A base commission. Additional financial incentives are available for premiums you pay in excess of a contract s base premiums. A base commission. A base commission. Additional financial incentives are available for premiums you pay in excess of a contract s target premiums. 4 1 Guarantees are backed by the claims-paying ability of Thrivent Financial for Lutherans. 2 Loans and surrenders will decrease the death proceeds and the value available to pay insurance costs and may cause the contract to terminate without value. Surrenders may generate an income tax liability, and charges may apply. A significant taxable event can occur if a contract terminates with outstanding debt. Contact your tax advisor for further details. Loaned values may accumulate at a lower rate than unloaned values. 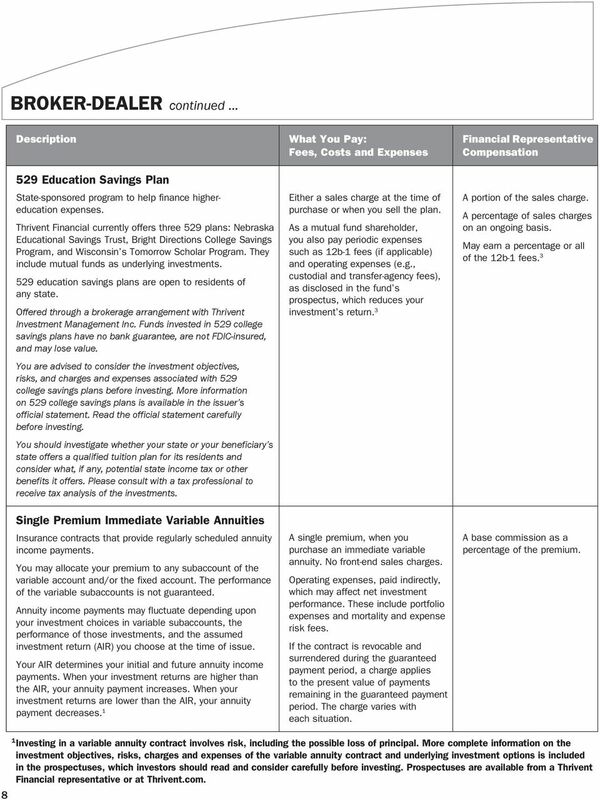 8 BROKER-DEALER continued Education Savings Plan State-sponsored program to help finance highereducation expenses. Thrivent Financial currently offers three 529 plans: Nebraska Educational Savings Trust, Bright Directions College Savings Program, and Wisconsin s Tomorrow Scholar Program. They include mutual funds as underlying investments. 529 education savings plans are open to residents of any state. Offered through a brokerage arrangement with Thrivent Investment Management Inc. Funds invested in 529 college savings plans have no bank guarantee, are not FDIC-insured, and may lose value. You are advised to consider the investment objectives, risks, and charges and expenses associated with 529 college savings plans before investing. More information on 529 college savings plans is available in the issuer s official statement. Read the official statement carefully before investing. You should investigate whether your state or your beneficiary s state offers a qualified tuition plan for its residents and consider what, if any, potential state income tax or other benefits it offers. Please consult with a tax professional to receive tax analysis of the investments. Single Premium Immediate Variable Annuities Insurance contracts that provide regularly scheduled annuity income payments. You may allocate your premium to any subaccount of the variable account and/or the fixed account. The performance of the variable subaccounts is not guaranteed. 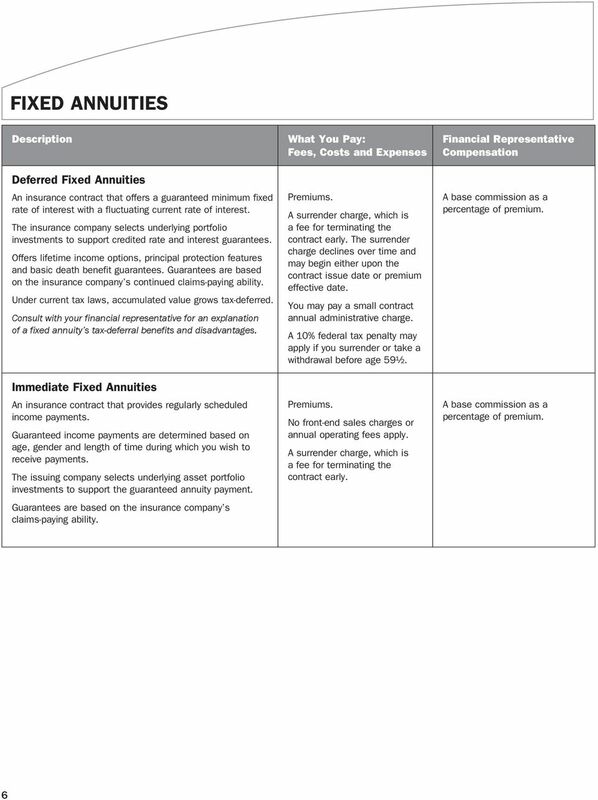 Annuity income payments may fluctuate depending upon your investment choices in variable subaccounts, the performance of those investments, and the assumed investment return (AIR) you choose at the time of issue. Your AIR determines your initial and future annuity income payments. When your investment returns are higher than the AIR, your annuity payment increases. When your investment returns are lower than the AIR, your annuity payment decreases. 1 Either a sales charge at the time of purchase or when you sell the plan. 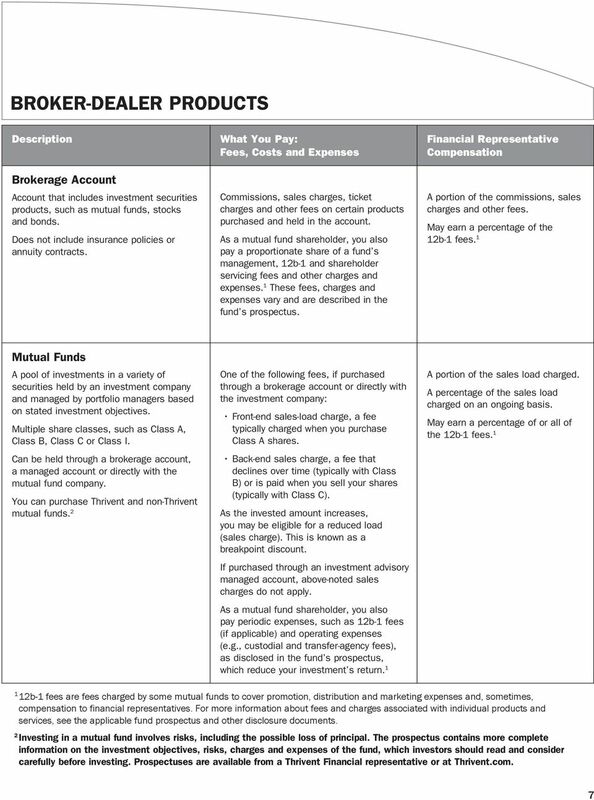 As a mutual fund shareholder, you also pay periodic expenses such as 12b-1 fees (if applicable) and operating expenses (e.g., custodial and transfer-agency fees), as disclosed in the fund s prospectus, which reduces your investment s return. 3 A single premium, when you purchase an immediate variable annuity. No front-end sales charges. Operating expenses, paid indirectly, which may affect net investment performance. These include portfolio expenses and mortality and expense risk fees. If the contract is revocable and surrendered during the guaranteed payment period, a charge applies to the present value of payments remaining in the guaranteed payment period. The charge varies with each situation. A portion of the sales charge. A percentage of sales charges on an ongoing basis. May earn a percentage or all of the 12b-1 fees. 3 A base commission as a percentage of the premium. 8 1 Investing in a variable annuity contract involves risk, including the possible loss of principal. More complete information on the investment objectives, risks, charges and expenses of the variable annuity contract and underlying investment options is included in the prospectuses, which investors should read and consider carefully before investing. 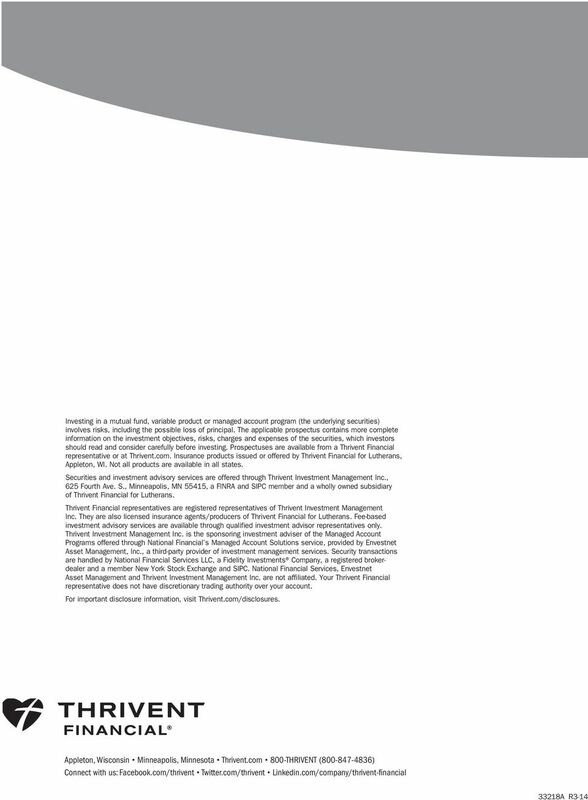 Prospectuses are available from a Thrivent Financial representative or at Thrivent.com. Additional information about UBS Financial Services Inc. is also available on the SEC s website at www.adviserinfo.sec.gov. Understanding Retirement Plan Fees and Expenses To view this and other EBSA publications, visit the agency s Web site at: www.dol.gov/ebsa. To order publications, contact us electronically at: www.askebsa.dol.gov.